My new “American Woman” necklace collection will be available on my website store soon! Details will be posted at a later date! Each named for a woman in my husband’s family in the US, the series was inspired by a Japanese client who visited my most recent solo show in Osaka. She then recalled her study experience in Florida and returned to the gallery the following week looking stunning in a simple woolen dress accentuated by the shimmering long pearls around her neck. This collection draws on the characteristics of each American lady and charms her positivity onto the wearer, thereby both sharing and building on each other’s energy. 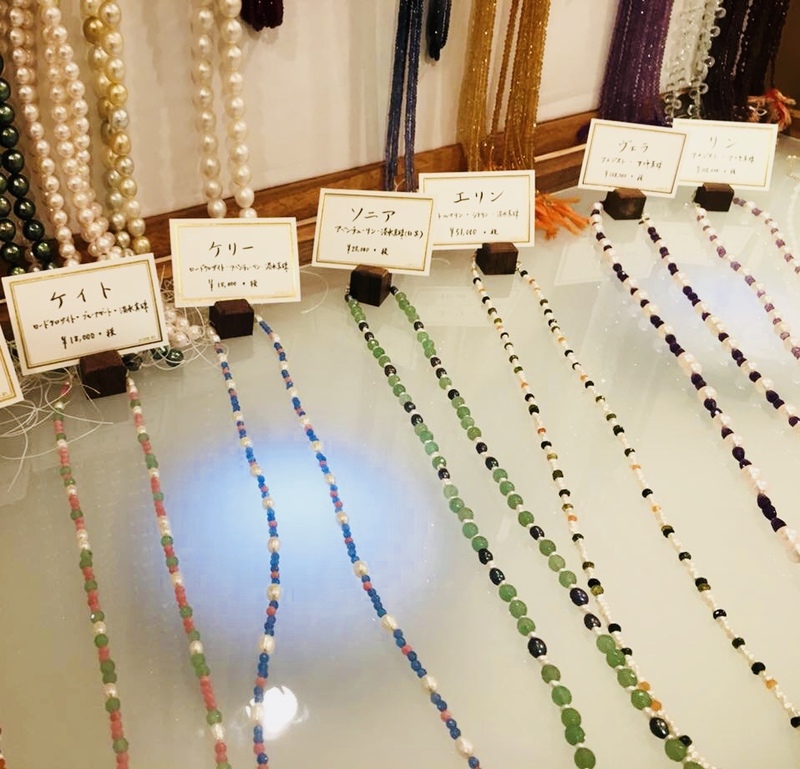 From January 10th until the 16th, the collection was on show at Hankyu, one of Japan’s premier department stores, where on the last day, “Sonja” was taken home by a gentleman who was searching for a gift for his 70 year old mother. The soft green aventurine necklace interspersed with small white and black freshwater pearls had a sense of humility balanced with a bold Art Deco chic look. When I explained that the actual Sonja is a yoga instructor and a circus performer in her forties who was youthful and full of vitality, he became very excited and said that he wanted his mother to feel beautiful. He asked for the jewel to be extended so that it will be easier for her to arrange with her clothes and promised to return the next day. When he returned, I put on the finishing touches in front of him and had a staff member model the necklace to make sure the length was perfect, he was full of relief and gratitude. After we had bowed to each other and said our thankful goodbyes, he walked out of the exhibition area and shyly looked back one more time. I could see he felt very special when he saw that I was still waiting to give my final bow before he turned the corner. Yes, at that moment I felt special too.